Thank you for inviting me. It’s an honor to be here. I love Time Out Youth. I admire the courage of your teens. I value the wisdom of your professionals. I cherish my friendships with your lay leaders – past and present. “What is forever?” I asked myself. There’s Forever 21 – the store. First of all, I can attest to the fact that the clothes do not last forever. And second of all, I am not sure any of us want to be forever 21. We made so many mistakes that year. Someone once said that they plan on opening a store next to Forever 21 called Finally 22. There is Forever young. We can attain that with our hearts but unfortunately not with our bodies. Then there is best friends forever… if you are lucky, you find that. Yet when you are sixteen, six months seems like forever. And when you are sixteen, and not in a setting where you can be yourself, a day can seem like forever. That is why we need Time Out Youth. The same applies to living life. The art of living resides in the pause between the notes. That pause between the notes, the space where the art resides, is a “time out.” The shining personalities of our youth and all of you who give your time, talent, treasure and love to Time Out Youth are where the metaphoric art of our Queen City resides. On this night we stop to cherish all that we have created in the twenty-six years gone by of Time Out Youth. For more than 26 years, Time Out Youth has created a sanctuary, shelter, and sacred space of understanding – for LGBT kids, for their parents, for all. And this past year was especially successful. Time Out Youth has purchased a beautiful new home – a ‘forever home’ – and raised the funds to pay for much of that home. What is forever? The Sabbath. What is forever? Our true selves. We all, at times, face struggles being our true selves. Perhaps it is our clothes. Perhaps it is our faith. Perhaps it our political beliefs, or our sexual orientation, or our gender identification. When we try too hard to be who we think others want us to be, we feel unsettled. Part of the glorious diversity of our Queen City is not just LGBT diversity but religious diversity. Friday is the Muslim Sabbath. Friday evening to Saturday night is the Jewish Sabbath and Sunday is the Christian Sabbath. I asked for a couple of days to deliberate. They say that you when you have two Jews, you have three opinions. So here I was as one Jew with two opinions. I value and love my faith and my family. I should be home on Shabbat. I value and love the LGBT community and Time Out Youth. I should be here on Shabbat. I wanted to be my true self and was torn. So here was my solution. I asked if I could light my Shabbat candles at this gala and be my true self and bring my two selves together – a Jew and a straight ally. So here I go… I welcome Shabbat. 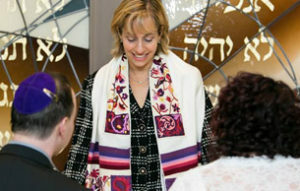 I invite any of you who are Jewish and feel comfortable with prayer to say the blessing with me. Shabbat Shalom. May it be a Sabbath of peace. Shabbat is a time to regroup, to refocus, to center ourselves. Time Out Youth is a time out for youth to do the same. Shabbat is a time out to stop the chaos of the world. Time Out Youth, too, helps our teens stop the chaos of the world. Time Out Youth celebrates acceptance over judgment and understanding over ignorance. Time Out Youth is about celebration over consternation. What is forever? Being our truest selves. On Shabbat we don’t work. We are not slaves – to our jobs, our homework, or housework. Shabbat is a time for being instead of doing. It is a day to celebrate not what we do, but who we are. She writes with Dr. Deepak Chopra: The true self is certain and clear about things. The everyday self gets influenced by countless outside influences, leading to confusion. The true self is at peace. The everyday self is easily agitated and disturbed. The true self is love. The everyday self, lacking love, seeks it from outside sources. The true self is self-reliant, evolutionary, loving, creative, knowing, accepting and peaceful. When we are our true selves, we shine like these candles. Jewish tradition teaches that after our lives when we stand in Judgment we will be asked seven questions. Among them are: Were you honest in business? Did you set time for learning? Did you seek wisdom and understand one thing from another? Were you your best self? The last question, the most important question, is “were you your best self”? You see we all get lost. As Oprah cautioned, we can get confused between what people say we are and who we know we are. We can get lost in life – not only as teens but in our mid-lives with midlife crises and even in our senior years (that is as senior citizens, not just high school seniors). We can get lost emotionally. We can get lost physically. We can even get lost on the crazy streets of Charlotte. Billy Graham Parkway becomes Woodlawn becomes Runnymeade becomes Wendover becomes Eastway. It changes names five times! Why? Our city has grown so fast that our major roads were only recently small neighborhoods. Yet not forcing the names of our streets into bland oneness is critical to our city maintaining its identity. The craziest and most confusing intersection of our city, where Queens meets Queens and Providence meets Providence, has another lesson to teach. At this junction, is a bronze figure of a gentleman whose name was Hugh. Each and every day, Hugh directed traffic sending people in the right direction. There was a stoplight then as there is today; but once the light would change, Hugh would wave on traffic, say hello and brighten everybody’s day. This man, who had a simple mind and lived with his mom throughout his life, found his passion doing what he did best. That made him worthy of the most frequently viewed memorial in town. Like Hugh, our goal for ourselves is to be our best. Being our truest and best selves is forever. 9 years ago, in an effort to support our High School youth, a group of clergy and lay leaders made a documentary called Souls of Our Students: Appreciating Differences. It is used for diversity training in CMS and in schools and businesses nationally. We found that teenagers, when given the opportunity, can be quite stellar at being their best selves. Last year, CMS, Time Out Youth and Temple Beth El added a nine minute video entitled, Souls of our Students: A Transgender Focus. Here’s a three minute clip celebrating teens who are working hard every day to be themselves. Time Out Youth enables our teens to be safe and to be their best selves. Our role is to support them. The complete 9 minute documentary can be accessed online at no cost. So if you have friends and relatives in a school system that doesn’t allow them to be their best selves, please google “Souls of our Students: A Transgender Focus”, send them the link and ask them to send it to their teachers, principals and school board so that we can expand our circle of allies who speak up for our youth. What is forever? Our truest selves. When we each are our truest selves, we support others in doing the same. Savage and Miller shared their truest selves and in doing so gave the strength to others to do the same. We can only imagine how many lives have been saved by this project that helps LGBT teens see that what seems like forever in teen years, in fact, does get better. When you are sixteen, six months seems like forever. And when you are sixteen, and not in a setting when you can be yourself, a day can seem like forever. The impact each of you can make on someone’s life. The mark you make on this world. We can’t all live forever but our task in life is to make a difference while we are here. What is forever? The Sabbath as a time to appreciate creation. What is forever? The mark we make on this world and the piece of the puzzle that we each complete in another’s life. Time Out Youth completes a critical piece in this community’s life and in countless youths’ lives and futures. For this we thank, we support and we celebrate Time Out Youth. May we each be our truest selves and support our teens in doing the same. May we each make our mark on this world and as we do, may we change the lives of those around us for the better… forever.